A former soldier has told the Ballymurphy inquest he could not believe his eyes when he spotted IRA gunmen approaching his position. He also spoke of "an extremely frightening experience" when his base came under "heavy and sustained fire". Witness M97 was a Lance Corporal in B Company 2 Para based in the Henry Taggart Hall on the Springfield Road. The inquest is examining 10 people's deaths in west Belfast in August 1971. 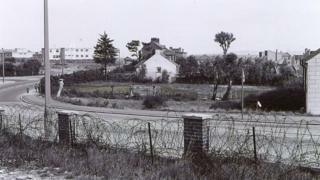 The deaths followed three days of gunfire in Ballymurphy following the introduction of internment. Ballymurphy shootings: Who were the victims? Witness M97 is giving evidence from behind a screen as the coroner has granted him anonymity. He described returning fire at muzzle flashes of weapons fired in his direction from waste ground known as the Manse area. Four people died as a result of the gunfire on 9 August 1971. They were Joan Connolly, Noel Phillips, Joseph Murphy and Daniel Teggart. Their families have always denied that the victims were armed or posing any threat to the base. M97 said he had been tasked to carry out an arrest on the first morning of internment, but that the suspect - whose name he cannot remember - had left the area before they got there. He said there was sustained rioting outside his base for the rest of the day. At times, he said he had climbed a ladder inside the hall at a gable end where a ventilation hole enabled him to see the rioters. He said he had fired rubber bullets from this position when the crowd seemed to get too close. He described the base coming under sporadic gunfire, and a hail of missiles including rocks, bricks, chisels, and even an axe. At one point, he said, a soldier in a sangar had to withdraw, as it was too dangerous to stay there. In the evening, he said he was up the ladder when he noticed four or five men coming down the Springfield Road, carrying weapons such as rifles and AK47s. M97 said he could not quite believe what he saw because the men were "so brazen". He thought it was like something "from a movie scene". He said he thought one of the men looked a bit like an IRA suspect he had encountered before, and shouted at him . He did not know if the man heard him or if he had, in fact, correctly identified him. Moments later, when heavy gunfire broke out, M97 said that he slid down the ladder, lifted his own SLR and went to a window alongside other soldiers looking towards the Manse area. "Being up a ladder with bullets flying past and bits of debris and tiles and glass is not the safest place to be." he said. M97 broke a hole in the window with the barrel of his weapon and made a hole large enough to fire through. He said he fired two shots at the area where he thought fire was being directed at them, in what was known to soldiers as a "double tap". He thought the gunmen were firing and moving on the waste ground. The court heard he did not know if his shots had hit anyone. He said he had fired at muzzle flashes. M97 confirmed that he had not shouted a warning but believed he had obeyed the conditions of the yellow card issued to soldiers, and which set out when they could open fire. The gunfire was so loud, he said, that it would not have been heard anyway. "You couldn't even hear the guy next to you, let alone anyone 150 yards away," he said. The former soldier said that the exchanges of gunfire lasted for some hours but he had not fired again. He believes there were many more gunmen than he had observed, firing from several different directions, including the Manse, New Barnsley and the Moyard area. Later, he said, he helped carry casualties into the hall after other soldiers had gone out and retrieved them from the area. He told the court that some of them were coherent and asking for help with their injuries. He remembered later seeing the body of Joan Connolly and thought she looked like a woman he had seen among the rioters earlier in the day. He said he had never seen anyone who had been shot before. M97 said that he does not remember giving a statement to the Royal Military Police after the incident, but is certain he would have had to account for the rounds he fired. Later, M97 was asked why no other military witness or any of the records mention him seeing the group of armed men. M97 said he didn't shout out at the time because the shooting started so quickly, but thinks he did mention it later. He replied, "I'm sure I did, I think it was viewed that it was of no interest." A barrister for the Teggart and Phillips families said to M97: "You could have killed someone couldn't you?" "You really don't know, do you?" asked the barrister. "No." the former soldier replied. M97 went on to say he hadn't seen a body or any further firing from the area he had shot at. He also denied seeing casualties brought into the base being kicked, punched and struck with rifle butts. "No", he said, "I didn't see it." Witness M97 said a couple of soldiers were with him at the window and he knows that other soldiers at the base were firing. Later, a barrister for the MOD asked M97 if he had been happy to cooperate with the Coroner. "Yes, because I didn't consider I did anything wrong, maybe I'm being naive" he said. M97 has now completed his evidence.